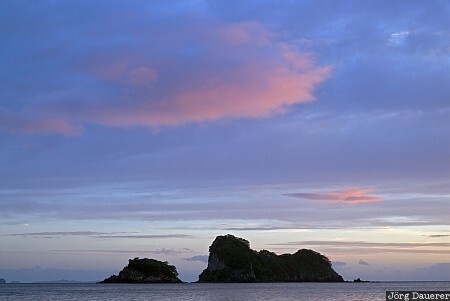 A colorful morning clouds over sea stacks in the Pacific Ocean at Cathedral Cove. Cathedral Cove is on the Coromandel Peninsula, Waikato, on the north island of New Zealand. This photo was taken in the morning of a sunny day in October of 2008. This photo was taken with a digital camera.